He did bring Buffalo Bill’s Wild West to Lynchburg four times. William Frederick “Buffalo Bill” Cody was born on a farm in Scott County, Iowa Territory, on February 26, 1846. Eight years later, his family moved to the Kansas plains, a frontier area that would soon earn the nickname “Bloody Kansas” as pro- and anti-slavery factions battled to secure the territory’s status. 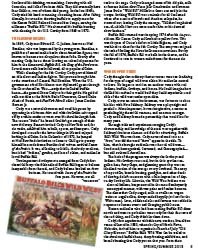 In 1854, Buffalo Bill’s abolitionist father, Isaac Cody, was stabbed by a slavery advocate. Though Isaac survived the attack, the wounds may have hastened his death from pneumonia in 1857. According to Buffalo Bill’s autobiography, he then became the breadwinner for his family. He took a job with a freight-wagon company, traveling a route that included a stop at Fort Laramie, Wyoming, where young Bill Cody is said to have met Kit Carson and Jim Bridger. In 1860, the same company established the Pony Express; however there is no solid evidence, despite Cody’s claims, that he became one of the riders. The fledgling service, which delivered mail from St. Joseph, Missouri, to Sacramento, California, lasted only eighteen months, until the Transcontinental Telegraph began operations in October 1861. During this period, Cody met and became friends with James Butler “Wild Bill” Hickok, and the paths of these two famous Americans would continue to cross. Roger Garfield and his wife Jan moved to Lynchburg in 2005 from the Chicagoland area where Roger worked as a high school teacher and administrator. They are enjoying the restoration of their 1905 home on Rivermont Avenue. Roger, an amateur historian, specializes in military history. Imagine his surprise when he found an archival photo of British Lancers parading down Church Street! 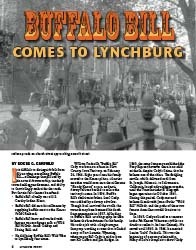 The result is this article on Buffalo Bill’s Lynchburg visits. The author wishes to extend special thanks to Mr. S. Allen Chambers Jr., Mr. Thomas G. Ledford, and Mr. James M. Elson; special thanks to Mr. Chuck Bradner and the research staff at the Jones Memorial Library; and very special thanks to Ms. Karen Van Gilder at the Buffalo Bill Historical Center. This is Roger’s second contribution to Lynch’s Ferry. “Taking the Rivermont Trolley,” coauthored with Graham C. Garfield, appeared in the Spring/Summer 2010 issue.